Recent neuropathologic autopsy studies found that 15 to 25% of elderly demented patients have Lewy bodies (LB) in their brainstem and cortex, and in hospital series this may constitute the most common pathologic subgroup after pure Alzheimer's disease (AD).The Consortium on Dementia with Lewy bodies met to establish consensus guidelines for the clinical diagnosis of dementia with Lewy bodies (DLB) and to establish a common framework for the assessment and characterization of pathologic lesions at autopsy. The importance of accurate antemortem diagnosis of DLB includes a characteristic and often rapidly progressive clinical syndrome, a need for particular caution with neuroleptic medication, and the possibility that DLB patients may be particularly responsive to cholinesterase inhibitors. We identified progressive disabling mental impairment progressing to dementia as the central feature of DLB. Attentional impairments and disproportionate problem solving and visuospatial difficulties are often early and prominent. Fluctuation in cognitive function, persistent well-formed visual hallucinations, and spontaneous motor features of parkinsonism are core features with diagnostic significance in discriminating DLB from AD and other dementias. Appropriate clinical methods for eliciting these key symptoms are described. Brainstem or cortical LB are the only features considered essential for a pathologic diagnosis of DLB, although Lewy-related neurites, Alzheimer pathology, and spongiform change may also be seen. We identified optimal staining methods for each of these and devised a protocol for the evaluation of cortical LB frequency based on a brain sampling procedure consistent with CERAD. This allows cases to be classified into brainstem predominant, limbic (transitional), and neocortical subtypes, using a simple scoring system based on the relative distribution of semiquantitative LB counts. Alzheimer pathology is also frequently present in DLB, usually as diffuse or neuritic plaques, neocortical neurofibrillary tangles being much less common. The precise nosological relationship between DLB and AD remains uncertain, as does that between DLB and patients with Parkinson's disease who subsequently develop neuropsychiatric features. Finally, we recommend procedures for the selective sampling and storage of frozen tissue for a variety of neurochemical assays, which together with developments in molecular genetics, should assist future refinements of diagnosis and classification. Dementia research during the last decade has revealed a complex pathologic and clinical heterogeneity. Neurodegeneration associated with Alzheimer's disease (AD) probably accounts for 50 to 60% of cases of dementia in elderly patients, and vascular dementia (VaD) has until recently been considered responsible for most remaining cases, occurring either alone or in association with AD. To improve diagnostic reliability and validity, operationalized criteria have been developed for these pathologic subtypes and for the clinical syndromes associated with them (e.g., NINCDS-ADRDA  and NINDS-AIREN ). These concepts have shaped the clinical nosology of the dementias as currently described in DSM-IV  and ICD 10,  but these systems do not incorporate recent findings that dementia with Lewy bodies may, in fact, account for a substantial proportion of elderly demented cases. Recent neuropathologic autopsy studies [6-10] reported the additional findings of Lewy bodies (LB), in the brainstem and cortex of elderly demented patients, and in most series they have been seen in 15 to 25% of all cases, constituting the largest pathologic subgroup after pure AD. LB are intracytoplasmic, spherical, eosinophilic neuronal inclusion bodies, previously identified in subcortical nuclei as one of the hallmarks of idiopathic Parkinson's disease (PD). Cortical LB are less well circumscribed and may be difficult to recognize using conventional staining methods but are more readily visualized with antiubiquitin immunocytochemical detection. The areas of predilection for LB are brainstem, subcortical nuclei, limbic cortex (cingulate, entorhinal, amygdala), and neocortex (temporal > frontal = parietal). [7,11] Some Alzheimer pathology, [7,9] predominantly beta amyloid deposition and diffuse plaque formation,  is a common feature of most, but not all, demented cases with cortical LB. Neocortical tangles are, however, seen in only a minority,  and histological and biochemical markers of paired helical filaments and abnormally phosphorylated tau are significantly reduced compared with AD. Differing interpretations of the relative significance of LB and Alzheimer pathology have led to various terminologies being applied to these cases, including LB variant of AD,  AD with PD changes,  dementia associated with cortical LB,  diffuse LB disease, [6,10,11] and senile dementia of LB type (SDLT). These terms probably describe similar groups of patients with a degree of clinical and neuropathologic variation attributable to referral based sampling biases. The Consortium recommends "Dementia with Lewy bodies" (DLB) as a generic term for these cases, because it acknowledges the presence of LB without specifying their relative importance in symptom formation with respect to other degenerative or vascular pathology that is simultaneously present. A common framework for the assessment and characterization of pathologic lesions at autopsy is similarly necessary. The following guidelines are based on a 2-day workshop during which researchers presented data and formulated consensus criteria for the clinical and pathologic diagnosis of DLB and identified future research objectives. Clinical diagnostic criteria for dementia with Lewy bodies. (Table 1) proposes clinical diagnostic criteria that predict with high likelihood that dementia is associated with cortical LB. These represent a refinement of earlier criteria proposed for dementia with cortical LB  and for SDLT. They are potentially applicable to patients with idiopathic PD who subsequently develop dementia. They do not exclude the presence of concomitant Alzheimer pathology, and some patients may simultaneously meet guidelines for the pathological and clinical diagnosis of AD. Progressive disabling mental impairment is a mandatory requirement for the diagnosis of DLB. Although brief tests of mental status or a clinician's bedside testing may confirm the presence of cognitive impairment, they may lack sufficient detail to discriminate DLB from AD or other dementias. Detailed psychometric testing may reveal a profile of deficits that helps to identify DLB. The presence of prominent deficits on tests of executive function and problem solving,  such as the Wisconsin Card Sorting Test, the Trail Making Test, and verbal fluency for categories and letters, may be useful clinical diagnostic indicators of DLB, as may disproportionate impairment on tests of visuospatial performance such as block design, clock drawing, or copying figures. With the progression of dementia, the selectivity of this pattern may be lost, making differential diagnosis based on clinical examination difficult during the later stages, when deficits in memory, language, and other cognitive skills frequently overlap with those seen in AD. Personal and social function and performance in daily living skills may be markedly impaired, even in the early stages, by a combination of cognitive and neurologic disability. Progression may be rapid (1 to 5 years), to an end stage of profound dementia and parkinsonism, although in other cases the course often resembles that of AD. Men may be more susceptible to DLB [6,11,16] and have a worse prognosis than women. At least one of the following three core features must be present for making a clinical diagnosis of DLB, when they occur in conjunction with the dementing syndrome previously described. Occurring alone, each of these features may be associated with a range of conditions other than DLB. The use of two or more core features for a diagnosis of probable DLB will confer higher diagnostic specificity (low false-positive diagnosis rate) and may be suitable for most research applications. A requirement for only one core feature for a diagnosis of possible DLB, may be more appropriate for use in clinical practice, with a relatively higher sensitivity (true positive rate). Fluctuation in cognitive function [16,21] is common in DLB. In the earliest stages, patients may show deficits of cognitive function and global performance that alternate with periods of normal or near-normal performance. Fluctuation also includes and indeed may be based on pronounced variations in attention and alertness. Excessive daytime drowsiness with transient confusion on waking is not uncommon and may be accentuated by an unstimulating environment. In contrast, DLB patients may show improved performance in response to environmental novelty and increased arousal (sometimes confounding formal cognitive testing), but these effects are usually only short lived. The periodicity and amplitude of fluctuations are variable, both between subjects and within the same individual. They are described as occurring rapidly (lasting minutes or hours), as well as slower (weekly or monthly) variations. Substantial changes in mental status and behavior may therefore be seen both within the duration of a single interview and/or between consecutive examinations. No typical diurnal pattern of fluctuation has been identified in DLB. Some patients identify the variable cognitive state themselves, but generally the most productive approach to identifying fluctuation is via a reliable informant. Diary keeping is a useful strategy, similar to that successfully used to measure motor fluctuations in PD. Minor day to day or diurnal/nocturnal variations (sundowning) commonly occur in most patients with dementia of any etiology and are familiar to experienced clinicians and caregivers of demented subjects. These mild fluctuations should not be accorded particular significance in the differential diagnosis of DLB. Caregivers also frequently report on DLB patients' somnolence, their reduced awareness of surroundings, and the confusion associated with this. Episodes of going blank or "switching off" are particularly suggestive of DLB, if other systemic and pharmacologic causes of disturbed consciousness have been excluded. The other extreme of fluctuation, often reported by DLB (but seldom by AD) caregivers, are periods of apparent spontaneous remission during which recall of recent information is evident and other cognitive functions may briefly return. The differential diagnosis of fluctuating cognition may include several conditions, including delirium due to medication toxicity or intercurrent illness. There are substantial difficulties inherent in defining and quantifying fluctuating cognition, particularly later in the illness when variability may become submerged in progressive cognitive deterioration. Despite its central importance, fluctuation is not therefore considered mandatory for the diagnosis of DLB (as it is in the Newcastle criteria for SDLT ), but it has been retained as a core feature with considerable diagnostic weight. Visual hallucinations (VH), typically recurrent, formed, and detailed, have been described by most groups investigating DLB, [7,15,16,22] and this appears to be the only psychotic symptom that reliably discriminates it from AD or VaD. [23,24] Hallucinations in other modalities, particularly auditory, may also occur in DLB but do so less frequently. There is considerable overlap between true visual hallucinatory symptoms (in the absence of an adequate external stimulus) and other perceptual disorders, including misidentification syndromes and visual agnosias. Patients may describe such experiences occurring simultaneously, for example, seeing faces emerging out of the patterns on chair cushions or hidden amongst trees and flowers at the same time as figures are observed against a blank background. Typical themes are of people and animals intruding into the patient's home, but inanimate objects are also seen and abstract perceptions such as writing on walls and ceiling are not unusual. The images are characteristically seen (and described) in considerable detail. Emotional responses vary through fear, amusement, or indifference, and a degree of insight into their unreality is often present. The relative balance between response and insight will dictate the need for antipsychotic treatment, which can be hazardous due to neuroleptic sensitivity. VHs may particularly occur during periods of diminished consciousness. They are exacerbated by visual impairment, probably as a consequence of selective sensory deprivation, and may be temporarily relieved by increased environmental stimulation such as occurs during a clinical interview or after a move into group living. Spontaneous motor features of parkinsonism, typically mild, are the third core feature of DLB. Rigidity and bradykinesia are the usual extrapyramidal symptoms,  while other common findings are hypophonic speech, masked facies, stooped posture, and a slow and shuffling gait. Resting tremor is less common, especially in older individuals. The order of onset of mental and motor symptoms is variable, particularly in older patients who often present a complex admixture of extrapyramidal and mental symptoms of almost simultaneous onset. It is suggested that if dementia occurs within 12 months of the onset of extrapyramidal motor symptoms, the patient should be assigned a primary diagnosis of possible DLB, and this will be strengthened by the presence of additional core or supportive features. If the clinical history of parkinsonism is longer than 12 months, PD with dementia (clinically DLB or other) will usually be a more appropriate diagnostic label (see Discussion). Unlike idiopathic PD in which motor response to levodopa is almost universal, a smaller, but as yet undetermined, proportion of DLB cases appear to show motor improvement, and levodopa responsiveness is not therefore necessary to support the diagnosis. In advanced AD and other dementias, parkinsonian signs may also be found, and in the terminal stages, paraplegia in flexion may occur. Parkinsonism appearing for the first time late in the course of a dementia is therefore consistent with a diagnosis of DLB but not specific for it. Neuroleptics, even at low doses, may induce parkinsonism in elderly or demented patients. DLB may be distinguished from drug-induced parkinsonism by persistence of motor symptoms after withdrawal of neuroleptics. Severe sensitivity to the adverse effects of neuroleptics also appears characteristic of DLB (see below). Severe parkinsonism spontaneously occurring in DLB may carry a particularly poor prognosis. A variety of additional clinical features have been included in preliminary reports of autopsy-confirmed DLB  but have not yet been demonstrated to have sufficient diagnostic specificity to merit core symptom status. Those considered of sufficient importance to warrant mention as supportive of a diagnosis of DLB are listed. Repeated falls, syncope, and transient losses of consciousness. Dementia of any etiology is probably a risk factor for all three clinical features, and it can be difficult to clearly distinguish between them, even when an "event" has been witnessed by a trained observer. Repeated falls may be due to posture, gait, and balance difficulties, particularly in patients with parkinsonism. Syncopal attacks in DLB with complete loss of consciousness and muscle tone  may represent the extension of LB associated pathology to involve the brainstem and autonomic nervous system. Focal neurologic signs and symptoms do not generally appear in conjunction with these episodes, aiding in their discrimination from transient ischemic attacks. The associated phenomenon of transient episodes of unresponsiveness without loss of muscle tone may represent one extreme of fluctuating attention and cognition. A severe adverse reaction to standard neuroleptic medication  may be an important indicator of underlying LB disorder but is of more importance in management than in the diagnostic process, especially if neuroleptic prescribing is routinely and desirably avoided in patients suspected of having DLB. Systematized delusions and hallucinations in other modalities. Delusional themes in DLB are usually based on recollection of hallucinations and other perceptual disturbances. They consequently have a fixed, complex, and bizarre content that contrasts with the mundane and often poorly formed persecutory ideas often encountered in AD patients, which are based on forgetfulness and confabulation. Auditory, olfactory, and tactile hallucinations, although substantially less common than visual perceptual disturbances, may be important features in some DLB cases and lead to initial diagnoses including temporal lobe epilepsy or delusional disorder (late paraphrenia). The identification of stroke disease, physical illness, or other brain disorder that may explain the clinical presentation is a necessary part of the evaluation of any demented patient. The general principles of clinically led examination and investigation detailed by the NINCDS-ADRDA working group  for the diagnosis of AD are equally applicable here. Although the presence of any of these features makes a diagnosis of DLB less likely, comorbidity is not unusual in elderly patients and DLB should not be excluded simply on this basis. Inexperienced clinicians are significantly more likely to underdiagnose DLB due to overinterpretation of previous or coexisting medical problems. VaD may be suspected and should be excluded using clinically and radiologically based criteria. The development of myoclonus in patients with a rapidly progressive form of DLB may lead the clinician to suspect Creutzfeldt-Jakob disease. In patients with intermittent delirium, appropriate examination and laboratory tests should be performed during the acute phase to maximize the chances of detecting infective, metabolic, inflammatory, or other etiologic factors. The importance of medication (prescribed or proprietary) in causing or exacerbating cognitive, hallucinatory, motor, or behavioral symptoms in elderly individuals, particularly those with cerebral dysfunction of any etiology, should not be overlooked. Drugs with anticholinergic or catecholaminergic effects are particularly, but not exclusively, implicated. DLB patients may present to psychiatry (cognitive impairment, psychosis, and behavioral disturbance), internal medicine (acute confusional states and syncope), or neurology (parkinsonism or disturbed consciousness) services. The details of clinical assessment will to some extent be shaped by these symptom and specialty biases. A detailed history from patient and reliable informants should document the time of onset of key symptoms, the nature of their progression, and their effects on social, occupational, and personal function. Specific enquiry should be made about cognitive, psychiatric, and neurologic features in all cases. Questions such as "are there episodes when his/her thinking seems quite clear and then becomes muddled?" may be useful probes to establish the presence of fluctuating cognition. Full mental state examination is essential and should include standardized tests of memory, attention, visuospatial ability, and executive function. Attentional impairments and hallucinations are much more likely to be recorded if the patient is observed passively, such symptoms being prone to diminish or disappear during a structured conversational interview. Formal psychometric testing may help to demonstrate a characteristic profile of cognitive deficits, particularly in the earlier stages. A careful search for extrapyramidal features should be part of a general neurologic examination. The use of a standardized scoring system for parkinsonian features may be particularly useful for research purposes and longitudinal assessment. The requirements for a full medical history, physical examination, and appropriate investigation have been discussed in considering exclusion features. There are as yet no definitive data about specific abnormalities on special investigation that confirm a diagnosis of DLB. Structural brain imaging using CT or MRI may show generalized cortical atrophy, and prominent frontal lobe changes have been suggested in a small number of cases. Cerebral blood flow visualized using single photon emission tomography appears to be reduced with a similar pattern to that seen in AD, and EEG shows early generalized background slowing with abnormal transients in the temporal lobes or frontally dominant burst patterns. Although no specific genetic markers have been identified, both the alipoprotein epsilon 4  and debrisoquine oxidase CYP2D6B  alleles appear with increased frequency in DLB. epsilon 4 allele frequency is also raised in pure AD but not in PD cases without dementia ; CY2D6B appears to be overrepresented in PD  but not AD. The likelihood of future developments in molecular genotyping justifies routine DNA archiving with appropriate consents. Pathologic features associated with DLB. Pathologic features associated with DLB are summarized in Table 2. LB are the only essential feature in the pathologic diagnosis of DLB; other features (e.g., plaques and neuron loss) are apparent in most but not all cases. Classic LB are spherical intracytoplasmic eosinophilic neuronal inclusion bodies but may be located extracellularly and be multilocular or fusiform in shape. The terms "brainstem" or "classic" Lewy body apply to inclusions with a hyaline core and pale halo typically seen in nigral and locus coeruleus neurons. The term "cortical Lewy body" refers to less well-defined spherical inclusions seen in cortical neurons. The term "pale body" describes the more granular eosinophilic inclusions lacking a halo, found in brainstem neurons that are often associated with LB disease and may have a precursor role in LB formation. Immunohistochemical and protein chemistry studies suggest that LB are composed predominantly of low-molecular-weight neurofilaments accompanied by medium- or high-molecular-weight forms. Both phosphorylated and nonphosphorylated neurofilament epitopes may be present and cross-linking of constituent protein(s) probably produces the dense hyaline core. The term "constitutional protein" describes the underlying structural (neurofilament) component of LB, and the term "associated protein" other constituents demonstrated by immunohistochemistry such as crystallin, ubiquitin, and enzymes of the ubiquitin cycle. Tau protein is not found in LB by conventional immunostaining,  and this distinguishes cortical LB from small spherical tangles. More detailed biochemical characterization of LB and their pathobiology are important research objectives. Both cortical and subcortical LB occur in DLB. [6-10] Classic LB in the brainstem are usually readily recognized in the substantia nigra and locus coeruleus. A careful search, however, may be required to identify LB in these nuclei, particularly in those cases with little or no neuron loss. Identification of cortical LB is usually performed after brainstem LB have been found but may be complicated by (i) the presence of severe Alzheimer changes and age-related pathology - in these cases identifying spherical inclusions as LB requires particular (ubiquitin and tau) staining techniques [8,13] and careful histologic assessment to distinguish LB from tangles; (ii) the need to distinguish cortical LB from small ballooned neurones by noting their absence of cellular extension, the lack of prominent vacuolation, and by using anti-neurofilament antibodies; and the relative sparsity of cortical LB in most DLB cases. The most appropriate histologic stain(s) for brainstem LB is H-E and for cortical LB H-E and/or ubiquitin (using tau immunostaining to distinguish cortical LB from small tangles). Other less-established staining methods for LB include the Campbell Switzer silver stain  and certain antineurofilament antisera. The need for a more specific and sensitive marker for cortical LB remains as an important future research objective. Recommended brain areas for sampling and evaluation of LB density are incorporated into the guidelines (see below) and Table 3. The assessment of substantia nigra neuronal loss should follow CERAD  protocols (section G, subcortical changes). Lewy-related neurites (LRN) are a distinctive part of LB pathology [10,36-38] representing a neurofilament abnormality in which the proteins are present as a diffuse aggregate that does not contain crystallin. The chemistry of protein interaction(s) giving rise to LRN suggest less covalent cross-linking than in LB. LRN are invisible using conventional H-E staining but highlighted by ubiquitin staining. They occur in the hippocampus (CA2/3 region), amygdala, nucleus basalis of Meynert, dorsal vagal nucleus, and other brainstem nuclei. In neuropathologic assessments, the presence of Lewy neurites in the hippocampus and/or nucleus basalis of Meynert should be documented but not quantified. Although some cases of DLB have no or little Alzheimer pathology, it is a common feature of most cases. The CERAD  protocol provides an appropriate semiquantitative measure of Alzheimer changes for general clinical-pathologic correlations. Plaque types in DLB should be subclassified as (i) diffuse, (ii) neuritic plaques with tau positive neurites, (iii) neuritic plaques with tau-negative ubiquitin-positive neurites, and (iv) optionally further categorized according to A4 immuno-reactivity. The precise nosological relationship of DLB and AD remains an unresolved issue. If one takes the view that the pathologic diagnosis of AD can be made solely on the presence of numerous neocortical plaques, then this would suggest that most cases of DLB are variants of AD. However, if one considers that the presence of neocortical tangles and tau-immunoreactive neuritic plaques  is necessary for a pathologic diagnosis of AD, then a much smaller proportion of DLB cases are classifiable as AD. Both neocortical and archicortical plaque and tangle density were believed by the workshop participants to be relevant in this distinction. The precise terminology used by individual groups in relation to AD is considered less important in practice than the need to establish a common protocol for assessing and evaluating pathologic lesions in DLB. This abnormality is a feature of some DLB cases  and occurs mainly in temporal cortex. It may relate to the severity of the disease. Although similar to spongiform change in Creutzfeldt-Jakob and prion-related diseases, there is no evidence that DLB is a transmissible disorder or linked to abnormal prion protein. The evaluation of synaptic density using immunochemical staining for synaptophysin and other related proteins is relevant to the pathophysiologic basis of dementia in DLB, but its assessment does not form part of the routine assessment of DLB cases. Assessment of vascular pathology should follow CERAD  recommendations for vascular disease (section D, gross findings), particularly those related to the distribution and size of infarcts (section 3, c and d). CERAD protocols should also be followed for other pathologies (e.g., evaluation of periventricular white matter). Guidelines for brain sampling, evaluation of LB distribution, and frequency and diagnostic rating protocol. Areas for sampling the cerebral cortex  at appropriate coronal levels are outlined in Figure 1, A-E. The three sections recommended for frontal (A), temporal (B), and parietal cortex (C) are compatible with recommended CERAD sections for neocortex (middle frontal gyrus, superior and middle temporal gyri, and inferior parietal lobule). The BA24 anterior cingulate region (D) is similar to that recommended by CERAD. The transentorhinal BA28 section (E) at the plane of the middle of the red nucleus is posterior to the CERAD recommended level for examination of the entorhinal cortex (CL14/15); CDLB members considered that the more posterior coronal level (CL17/18) provided greater consistency in transentorhinal/parahippocampal gyral areas for LB counts. This anatomic aspect will be reconsidered in future CDLB/CERAD interactions. Brainstem sampling follows CERAD. Figure 1. 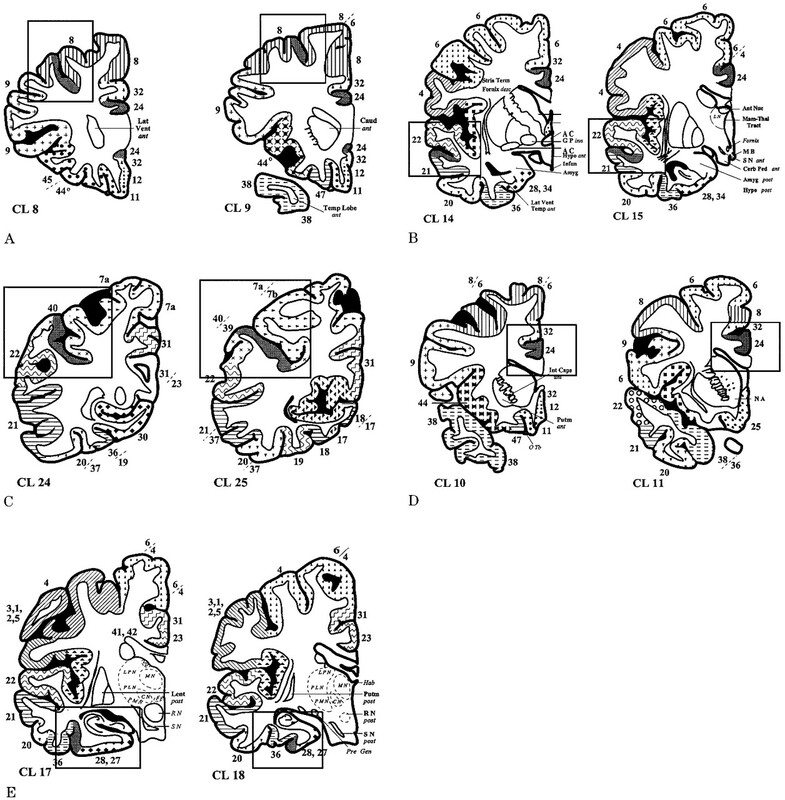 Outline diagrams of coronal slices through the human brain depicting Brodmann areas and central brain landmarks: (A) frontal (middle frontal gyrus BA 8/9), (B) temporal (middle temporal gyrus BA21), (C) parietal (inferior parietal lobule BA 40), (D) anterior cingulate (BA 24), and (E) transentorhinal (parahippocampal gyrus BA 28). For each cortical region, the two coronal levels (CL) shown represent the recommended rostral and caudal limits of the designated areas to be sampled (gray hatch). The full brain map is filed with the National Auxiliary Publication Service (NAPS). Macroscopically visible landmarks useful in identifying coronal levels: AC = anterior commissure; Amyg = amygdaloid; Amyg post = amygdaloid posterior; Ant Nuc = anterior nucleus of thalamus; Caud ant = caudate nucleus anterior limit; Cerb Ped ant = cerebral peduncle anterior limit; Fornix desc = fornix descending; G P inn = globus pallidus inner segment; Hypo ant = hypothalamus anterior; Hypo post = hypothalamus posterior; Infun = infundibulum; Int Caps ant = internal capsule anterior limit; Lat Vent ant = lateral ventricle anterior limit; Lat Vent Temp ant = lateral ventricle temporal horn anterior; Lent post = lentiform nucleus posterior limit; Mam-Thal Tract = mammillary-thalamic tract; M B = mammillary body; N A = nucleus accumbens; O Tb = olfactory tubercle; Pre Gen = pregeniculate nuclei; Putm ant = putamen anterior limit; Putm post = putamen posterior limit; R N = red nucleus; R N post = red nucleus posterior limit; S N = substantia nigra; S N ant = substantia nigra anterior limit; S N post = substantia nigra posterior limit; Stria Term = stria terminalis; Temp Lobe ant = temporal lobe anterior limit. Thalamic nuclei (not necessarily visible macroscopically); C N = central nucleus; F N = fasicular nucleus; Hab = habenular; L N = lateral nucleus; L P N = lateral posterior nucleus; M N = medial nucleus; P L N = posterolateral nucleus; P M N = posteromedial nucleus. A protocol for the evaluation of LB frequency in five cortical regions is outlined in Table 3B. The numerical scoring system recommended differs slightly from the semiquantitative severity rating system generally adopted in CERAD (0, absent; 1, mild; 3, moderate; 5, severe). CERAD does not rate LB frequencies. The Consortium agreed, based on the original work of Kosaka, [6,11,44] to divide cases into three main subtypes Table 3C according to the relative distribution of LB in the brainstem, limbic, and neocortical regions. (If CERAD-type severity scores are used such that >5 LB/area is scored as 3 [moderate severity], the total range scores become brainstem 0 to 2, limbic 3 to 8, and neocortical 9 to 15 [see Table 3C].) These divisions will form the basis of clinicopathologic correlative studies to determine if they relate to clinical subtypes. Collection of frozen brain tissue from DLB cases for biochemical analysis is recommended where possible on selected cortical areas, with striatum as an additional option Table 4. Although there are not yet specific chemical markers for the presence of LBs, there is evidence that neocortical cholinergic transmitter activities are lower in DLB than AD. [45-47] Such activities include the enzymes choline acetyltransferase and acetylcholinesterase. There is also evidence in DLB for impaired monoaminergic neurotransmission in the striatum [46,48] and abnormalities in dopamine receptors relating to neuroleptic drug response. These neurochemical indices can be measured using standard assays in gray matter from small (<1g) cortical samples, removed from the intact or sectioned hemisphere and frozen. For other transmitter analysis, including monoamines, metabolites, transporters or receptor, mRNA, rigid freezing protocols need to be applied, including "flash" freezing and storage below -70 degrees C. This is the preferred method for all neurochemical analyses if the option exists, although for enzyme and receptor binding, tissue frozen and stored at -20 degrees C can be used. Where possible, control material and cases of AD should also be included in the analysis. These data will provide individual or multiple centers with the answers to such questions as What are the neurochemical correlates of the mental and motor symptoms of DLB?, Are much reduced cholinergic activities in the neocortex a marker of DLB?, and Can responders to cholinergic therapy be identified biochemically? Remaining frozen tissue can be retained for measurement of other indices such as abnormally phosphorylated tau (not generally present to the same extent as in AD ) or genetic and other markers that may ultimately be applicable to the diagnosis or biological understanding of DLB. The formulation of these diagnostic criteria is based on the supposition that DLB exists as a disorder with discernible pathologic and clinical boundaries. The potential overlap with other conditions causing dementia, notably AD and vascular dementia, must be considered, however, as must the relationship with PD. Molecular genetic studies may assist in describing the overlapping nature of these related disorders. AD and DLB, but not PD or "pure LB disease" without concomitant Alzheimer pathology, share an elevated alipoprotein epsilon 4 allele frequency, [30,32] whereas the CYP2D6B allele is overrepresented in PD  and DLB  but not AD. Measures of specific antigens in CSF, including hyperphosphorylated tau and polyubiquitinated proteins, may also prove useful in differential diagnosis. A single set of clinical diagnostic criteria encompassing the whole spectrum of LB disease would need to include presentations varying from motor PD to cases presenting with dementia. This diverse clinical heterogeneity would make such criteria difficult to apply in practice. This has been resolved by recognizing that DLB may either present as a primary neuropsychiatric syndrome, in which situation the important diagnostic discrimination is from other causes of dementia, particularly AD and VaD, or it may develop later in a patient already diagnosed as having PD. In such circumstances, the term PD with dementia should be used. A minimum of 12 months with "motor only" symptoms is recommended to define this latter category, a period that has been arbitrarily selected to guide clinical practice but may need revision when additional information becomes available about the genetic and pathologic differences between clinical phenotypes. One might anticipate that the hallmark features of primary DLB will be helpful in identifying those PD patients in whom neuropsychiatric disorder is associated with cortical progression of LB pathology. Although clinicians prefer a diagnostic taxonomy, neuropathologists faced with the complexity of neurodegeneration in the brain often prefer to detail the pathology present. The neuropathologic assessments proposed provide both a descriptive diagnosis and a semiquantitative rating of pathologic burden. This allows both for a standard neuropathologic identification of DLB and for combined clinical and pathologic diagnoses to be made according to locally used terminologies. The CERAD protocol, which is a useful advance in systematically and reproducibly categorizing neuropathologic correlates of dementia, already encompasses not only AD and VaD but also PD. At the present time, cases corresponding to DLB by the Consortium criteria will be arbitrarily assigned in CERAD to categories 5a (definite Parkinson's disease with LBs) and 6 (PD-related changes). These new guidelines are intended to contribute toward future revisions of CERAD rather than constituting entirely independent pathologic criteria. The full CERAD protocol is, however, a considerable undertaking and does not need to be completed in full to make a pathologic diagnosis of DLB. The clinical diagnostic criteria proposed represent a refinement of earlier systems [15,16] and are equally applicable to patients with predominantly neuropsychiatric presentations and those in whom such symptoms follow an earlier diagnosis of PD. Many DLB patients will meet existing guidelines for the clinical diagnosis of AD  and should therefore be eligible to enter AD treatment and research studies. We recommend that the possible inclusion of DLB cases in clinically diagnosed AD research samples be taken into account both in study design and during the analysis and interpretation of data in such studies. Accurate estimates also need to be made of the prevalence of DLB in representative clinical and community based populations. The DLB Consortium members are as follows: Dr. Larry Altstiel, Lilly Corporate Center, Indianapolis, IN; Dr. Clive Ballard, MRC Neurochemical Pathology Unit, Newcastle upon Tyne, UK; Dr. Catherine Bergeron, Centre for Research in Neurodegenerative Disease, University of Toronto, Canada; Professor Alistair Burns, Department of Psychiatry, University of Manchester, UK; Dr. Jane Byrne, Department of Psychiatry, University of Manchester, UK; Dr. Janet Carter, Institute of Psychiatry, London, UK; Mr. Daniel Collerton, Clinical Psychology Department, Bensham General Hospital, UK; Dr. Owen Collins, Bayer plc, London, UK; Dr. Alan Cross, Astra Neuroscience Research Unit, London, UK; Dr. Rob de Vos, Streeklaboratoria Voor Pathologie, Enschede, The Netherlands; Dr. Dennis Dickson, Department of Pathology, Albert Einstein College of Medicine, New York, NY; Dr. Lutz Drach, Neurologisches Institut, Frankfurt, Germany; Dr. Sarah Eagger, St. Charles Hospital, London, UK; Professor Jim Edwardson, MRC Neurochemical Pathology Unit, Newcastle upon Tyne, UK; Dr. Murat Emre, Sandoz Pharma Ltd, Basel, Switzerland; Dr. Andrew Fairbairn, Newcastle City Health NHS Trust, Newcastle upon Tyne, UK; Dr. Douglas Galasko, Department of Neurosciences, University of California, San Diego, CA; Dr. Lawrence Hansen, Department of Neurosciences, University of California, San Diego, CA; Dr. Charles Harrington, Department of Psychiatry, University of Cambridge Clinical School, UK; Dr. Jane Havercroft, Medical Research Council, London, UK; Dr. Paul Ince, MRC Neurochemical Pathology Unit, Newcastle upon Tyne, UK; Dr. Ernst NH Jansen, Hospital Medisch Spectrum Twente, Enschede, Netherlands; Dr. Evelyn Jaros, Department of Neuropathology, Newcastle General Hospital, UK; Professor Kurt Jellinger, L Boltzmann Institute of Clinical Neurobiology, Vienna, Austria; Professor Amos Korczyn, Department of Neurology, Tel Aviv University, Israel; Professor Kenji Kosaka, Department of Psychiatry, Yokohama City University, Japan; Dr. Shigeki Kuzuhara, Department of Neurology, Mie University School of Medicine, Japan; Dr. Florence Lebert, Centre de la Memoire, Centre Hospitalier Regional et Universitaire de Lille, France; Dr. Chong Lee, Vancouver Hosp & Health Sciences Centre, University of British Columbia, Canada; Dr. Graham Lennox, Department of Neurology, University of Nottingham Medical School, UK; Dr. Paolo Liberini, Division of Pharmacology, Universita degli studi di Brescia, Italy; Dr. Simon Lovestone, Institute of Psychiatry, London, UK; Dr. Jim Lowe, Queens Medical Centre, University of Nottingham, UK; Dr. Elizabeth Marshall, Department of Psychiatry, University of Newcastle upon Tyne, UK; Dr. Richard Mayeux, Columbia University, New York, NY; Professor Ian McKeith, Department of Old Age Psychiatry, University of Newcastle upon Tyne, UK; Dr. Rupert McShane, Department of Psychiatry, University of Oxford, UK; Dr. Bruce Miller, Department of Neurology, University of California, Los Angeles, CA; Dr. Suzanne Mirra, Department of Pathology and Laboratory Medicine, VA Medical Center and Emory University School of Medicine, Atlanta, GA (advisory member on behalf of CERAD Neuropathology Task Force); Dr. John O'Brien, Department of Old Age Psychiatry, University of Newcastle upon Tyne, UK; Dr. Alun Owen, Kings College, London, UK; Professor Elaine Perry, MRC Neurochemical Pathology Unit, Newcastle upon Tyne, UK; Dr. Robert Perry, Department of Neuropathology, Newcastle General Hospital, UK; Mrs. Margaret Piggott, MRC Neurochemical Pathology Unit, Newcastle upon Tyne, UK; Dr. Niall Quinn, Institute of Neurology, London, UK; Professor Harvey Sagar, Department of Clinical Neurology, University of Sheffield, UK; Dr. Arjun Sahgal, MRC Neurochemical Pathology Unit, Newcastle upon Tyne, UK; Dr. Tsunao Saitoh, Alzheimer's Disease Research Center, University of California San Diego, CA; Dr. David Salmon, Alzheimer's Disease Research Center, University of California, San Diego, CA; Dr. DJS Sirinathsinghji, Merck Sharp & Dohme, Harlow, UK; Dr. Peter Thompson, Department of Old Age Psychiatry, Bensham General Hospital, UK; Dr. Nora Turjanski, MRC Clinical Sciences Centre, London, UK; Dr. Joanna Ward, The Wellcome Trust, London, UK; Professor Gordon Wilcock, Department of Care of the Elderly, University of Bristol, UK. Particular thanks are due to Tanya Freeman, IHE Administrator, who organized the meeting and to Alison Wright and Maureen Middlemist for secretarial support. Readers can obtain 2 pages of supplementary material from the National Auxiliary Publications Service, c/o Microfiche Publications, PO Box 3513, Grand Central Station, New York, NY 10163-3513. Request document no. 05334. Remit with your order (not under separate cover), in US funds only, $7.75 for photocopies or $4.00 for microfiche. Outside the United States and Canada, add postage of $4.50 for the first 20 pages and $1.00 for each 10 pages of material thereafter, or $1.75 for the first microfiche and $.50 for each fiche thereafter. There is a $15.00 invoicing charge on all orders filled before payment. Tomlinson BE, Blessed G, Roth M. Observations on the brains of demented old people. J Neurol Sci 1970;11:205-242. McKhann G, Drachman D, Folstein M, et al. Clinical diagnosis of Alzheimer's disease: report of the NINCDS-ADRDA Work Group under the auspices of Department of Health and Human Services Task Force on Alzheimer's disease. Neurology 1984;34:939-944. Roman GC, Tatemich ITK, Erkinjuntti T, et al. Vascular dementia: diagnostic criteria for research studies. Report of the NINDS-AIREN international workshop. Neurology 1993;43:240-260. American Psychiatric Association. Diagnostic and Statistical Manual of Mental Disorders, 4th ed. Washington DC: American Psychiatric Association, 1994. World Health Organisation. The ICD-10 classification of mental and behavioural disorders. Geneva: WHO, 1992. Kosaka K, Yoshimura M, Ikeda K, et al. Diffuse type of Lewy body disease: progressive dementia with abundant cortical Lewy bodies and senile changes of varying degree-a new disease? Clin Neuropathol 1984;3:185-192. Perry RH, Irving D, Blessed G, et al. Senile dementia of Lewy body type. A clinically and neuropathologically distinct type of Lewy body dementia in the elderly. J Neurol Sci 95:119-139. Lennox G, Lowe J, Morrell R, et al. Anti-ubiquitin immunocytochemistry is more sensitive than conventional techniques in the detection of diffuse Lewy body disease. J Neurol Neurosurg Psychiatry 1989;52:67-71. Hansen LA, Salmon D, Galasko D, et al. The Lewy body variant of Alzheimer's disease: a clinical and pathologic entity. Neurology 1990;40:1-8. Dickson DW, Ruan D, Crystal H, et al. Hippocampal degeneration differentiates diffuse Lewy body disease (DLBD) from Alzheimer's disease: light and electron microscopic immunocytochemistry of CA2-3 neurites specific to DLBD. Neurology 1991;41:1402-1409. Kosaka K. Diffuse Lewy body disease in Japan. J Neurol 1990;237:197-204. Ince PG, Irving D, McArthur F, et al. Quantitative neuropathological study of Alzheimer-type pathology in the hippocampus: comparison of senile dementia of Alzheimer type, senile dementia of Lewy body type, Parkinson's disease and non-demented elderly control patients. J Neurol Sci 1991;106:142-152. Harrington CR, Wischik CM, Hurt J, et al. Senile dementia of Lewy body type and Alzheimer type are biochemically distinct in terms of paired helical filaments and hyperphosphorylated tau proteins. Dementia 1994;5:215-228. Ditter SM, Mirra SS. Neuropathologic and clinical features of Parkinson's disease in Alzheimer's disease patients. Neurology 1987;37:754-760. Byrne EJ, Lennox G, Godwin Austen RB, et al. (Nottingham Group for the study of Neurodegenerative Disorders). Diagnostic criteria for dementia associated with cortical Lewy bodies. Dementia 1991;2:283-284. McKeith IG, Perry RH, Fairbairn AF, et al. Operational criteria for senile dementia of Lewy body type (SDLT). Psychol Med 1992;22:911-922. McKeith IG, Fairbairn AF, Perry RH, et al. Neuroleptic sensitivity in patients with senile dementia of Lewy body type. B Med J 1992;305:673-678. Perry EK, Haroutunian V, Davis KL, et al. Neocortical cholinergic activities differentiate Lewy body dementia from classical Alzheimer's disease. Neuro Report 1994;5:747-749. Sahgal A, Galloway PH, McKeith IG, et al. A comparative study of attentional deficits in senile dementias of Alzheimer and Lewy body types. Dementia 1992;3:350-354. Salmon DP, Galasko D. Neuropsychological aspects of Lewy body dementia. In: Perry RH, McKeith IG, Perry EK, Dementia with Lewy bodies. New York: eds. Cambridge University Press, 1996:99-113. Byrne EJ, Lennox G, Lowe J, et al. Diffuse Lewy body disease: clinical features in 15 cases. J Neurol Neurosurg Psychiatry 1989;52:709-717. Klatka LA, Louis ED, Schiffer RB. Psychiatric features in diffuse Lewy body disease. Neurology 1996;47:1148-1152. Ballard C, Harrison RWS, Lowery K, McKeith IG. Noncognitive symptoms in Lewy body dementia. In: Perry RH, McKeith IG, Perry EK, eds. Dementia with Lewy bodies. New York: Cambridge University Press, 1996:67-84. McShane R, Gedling K, Reading M, et al. Prospective study of relations between cortical Lewy bodies, poor eyesight and hallucinations in Alzheimer's disease. J Neurol Neurosurg Psychiatry 1995;59:185-188. McKeith IG, Fairbairn AF, Harrison RS. The management of the non-cognitive symptoms of Lewy body dementia. In: Perry RH, McKeith IG, Perry EK, eds. Dementia with Lewy bodies. New York: Cambridge University Press, 1996:381-396. Galasko D, Hansen LA. Lewy body disease. Curr Opin Neurol Neurosurg 1992;5:889-894. McKeith IG, Fairbairn AF, Bothwell RA, et al. An evaluation of the predictive validity and inter-rater reliability of clinical diagnostic criteria for senile dementia of Lewy body type. Neurology 1994;44:872-877. Forstl H, Burns A, Levy R, et al. The Lewy-Body variant of Alzheimer's disease. Clinical and pathological findings. BJ Psychiatry 1993;162:385-392. McKeith IG. Lewy body disease. Curr Opin Psychiatry 1995;8:252-257. Galasko D, Saitoh T, Xia T, et al. The apolipoprotein E allele epsilon 4 is over-represented in patients with the Lewy body variant of Alzheimer's disease. Neurology 1995;44:1950-1951. Saitoh T, Xia Y, Chen X, et al. The CYP2D6B mutant allele is over-represented in the Lewy body variant of Alzheimer's disease. Ann Neurol 1995;37:110-112. Marder K, Maestre G, Cote L, et al. The apoliprotein epsilon 4 allele in Parkinson's disease with and without dementia. Neurology 1996;44:1330-1331. Armstrong M, Daly AK, Cholerton S, et al. Mutant debrisoquine hydroxylation genes in Parkinson's disease. Lancet 1992;339:1017-1018. Dale GE, Probst A, Luthert P, et al. Relationships between Lewy bodies and pale bodies in Parkinson's disease. Acta Neuropathol (Berl) 1992;83:525-529. Pollanen MS, Dickson DW, Bergeron C. Pathology and biology of the Lewy body. J Neuropathol Exp Neurol 1993;52:183-191. Braak H, Braak E, Yilmazer D, et al. Nigral and extranigral pathology in Parkinson's disease. J Neural Transm 1995;46(suppl):15-31. Kim H, Gearing M, Mirra SS. Ubiquitin positive CA2/3 neurites in hippocampus coexist with cortical Lewy bodies. Neurology 1995;45:1765-1770. Gai WP, Blessing WS, Blumberger PC. Ubiquitin-positive degenerating neurites in the brainstem in Parkinson's disease. Brain 1995;118:1447-1460. Mirra SS, Heyman A, McKeel D, et al. The Consortium to Establish a Registry for Alzheimer's Disease (CERAD). Part II. Standardisation of the neuropathologic assessment for Alzheimer's disease. Neurology 1991;41:479-486. Hansen LA, Masliah E, Galasko D, et al. Plaque only Alzheimer disease is usually the Lewy body variant, and vice versa. J Neuropathol Exp Neurol 1993;52:648-654. Braak H, Braak E. Neuropathological staging of Alzheimer related changes. Acta Neuropathol (Berl) 1991;82:239-259. Hansen LA, Masliah E, Terry RD, et al. A neuropathological subset of Alzheimer's disease with concomitant Lewy body disease and spongiform change. Acta Neuropathol 1989;78:194-201. Perry RH. Coronal map of Brodmann areas in the human brain. In: Roberts GW, Leigh PN, eds. Neuropsychiatric disorders. London: Wolfe, 1993:1-10. Kosaka K, Iseki E, Odawara T, et al. Cerebral type of Lewy body disease - a case report. Neuropathology 1994;16:72-75. Dickson DW, Davies P, Mayeux R, et al. Diffuse Lewy body disease. Acta Neuropathol 1987;75:8-15. Langlais PJ, Thal L, Hansen LA. Neurotransmitters in basal ganglia and cortex of Alzheimer's disease with and without Lewy bodies. Neurology 1993;43:1927-1934. Perry EK, Irving D, Kerwin JM, et al. Cholinergic transmitter and neurotrophic activities in Lewy body dementia: similarity to Parkinson's and distinctions from Alzheimer's disease. Alzheimer Dis Assoc Disord 1993;7:69-79. Perry EK, Marshall EF, Perry RH, et al. Cholinergic and dopaminergic activities in senile dementia of Lewy body type. Alzheimer Dis Assoc Disord 1990;4:87-95. Piggott M, Perry EK, Marshall EF, et al. Nigrostriatal dopaminergic activities in Lewy body dementia in relation to neuroleptic sensitivity: comparison with Parkinson's disease. Biol Psychiatry 1996 (in press).